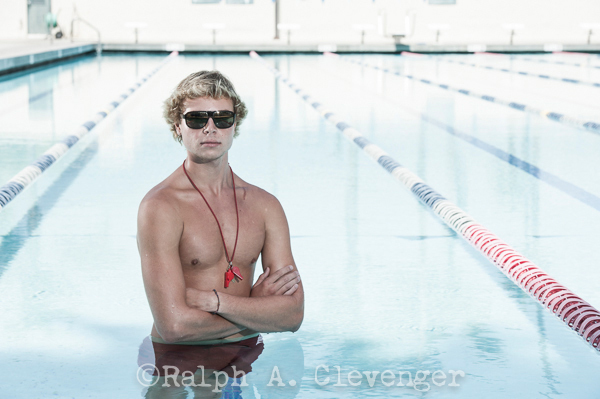 I had a chance to photograph a couple of the lifeguards at the Santa Barbara historic Los Banos del Mar city pool. It was a bright, sunny day so I moved Dustin into the shade cast by a palm tree at the shallow end of the pool. I set up one flash, gridded, on camera left to give him some edge lighting and the key flash on the right, no diffusion, just a bare flash. ISO 200 at 1/250sec, f/8, blew out the background by about 1 2/3 stops. Overexposing the sunlit area kept the background from looking too busy and really helped focus the eye on Dustin. This lighting/exposure technique is a favorite of fashion shooters on location.